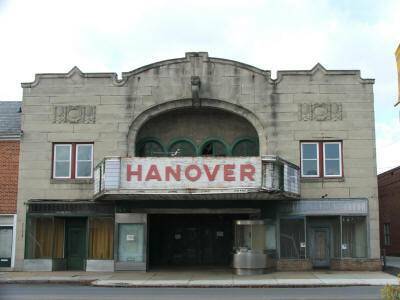 The Hanover Theater, located in Hanover, Pennsylvania, opened in 1928 as the State Theatre and was used as a theater until December of 1986 when it was closed and sold to a group that planned on converting it into an antiques mall. The group started the conversion, but work stopped in the early 1990's and after that the theater was used as a warehouse. In October of 2007 it was sold to a holding company which was to safeguard the theater until an out of state preservation organization could raise funds and restore it. That organization did not follow through on it's plans and today the building is for sale. The price is $550,000. The building is has over 12,000 square feet of finished space with at least another 2,000 of unfinished space. The building is equipped with a full stage complete with a fly tower with 50 feet of space above the stage. The auditorium is adorned with cast plaster pilasters as well as ornamental plaster moldings and other elaborate treatments. Construction is primarily an I beam skeleton with steel purlins and brick infill for the walls. Lot size is approximately 60' by 230'. The building was designed by William Harold Lee who is credited with at least 80 theaters, predominantly in the Philadelphia area. Only 16 are still standing. The interior decorator was Arthur Brounet a well known decorator who often collaborated with Thomas Lamb, the most prolific theater architect of his day. Today there are only two complete Brounet decorated theaters still in existance, the Hanover Theater and the Byrd Theatre in Richmond, VA. The building was last used as a movie theater and is still equipped with its projectors. There is great interest in the community in seeing the theater reopened, not only for movies but also as a performance space for shows and bands. The building's size, method of construction and downtown location also make it ideal for conversion to other uses including apartments, self storage, warehouse, or industrial/manufacturing.